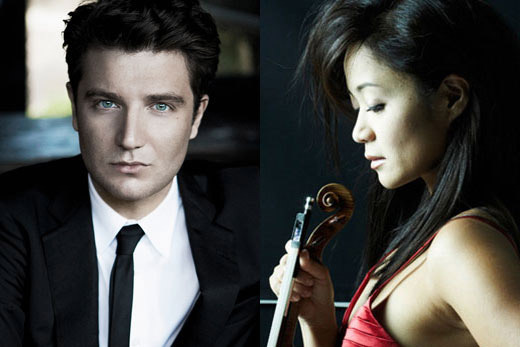 Pianist Alessio Bax and violinist Chee-Yun perform Saturday, Oct. 7, to kick off this year's Candler Concert Series. The 2017-2018 Candler Concert Series kicks off its 15th year in Emory's Schwartz Center for Performing Arts on Saturday, Oct. 7, at 8 p.m. with the pairing of pianist Alessio Bax and violinist Chee-Yun in a program that includes Beethoven, Busoni and Brahms. Violinist Chee-Yun has enraptured audiences on five continents with her flawless technique and dazzling tone. She performs regularly with the world’s foremost orchestras and has toured the United States with the San Francisco Symphony and Japan with the NHK Symphony. In addition to their joint performance, both artists will offer free master classes before the concert. The master class with Alessio Bax is set for Saturday, Oct. 7, at 2 p.m. Emerson Concert Hall at the Schwartz Center. The master class with Chee-Yun is also Saturday at 2 p.m., held in the Schwartz Center's Tharp Rehearsal Hall. Each year, the Candler Concert Series brings internationally renowned artists to Emory. Candler artists range from large ensembles to solo artists, and come from a wide variety of musical genres. The 2017-2018 series takes audiences around the world, with performances from India’s tabla sensation Zakir Hussain, China National Symphony Orchestra and Austria’s famed Vienna Boys Choir, in addition to some of America’s own most established and emerging artists. Along with standout solo performers such as vocalist Susan Graham and pianist Murray Perahia, several collaborations are premiering in Atlanta as part of the series. “The first-ever pairing of New Orleans’ Preservation Hall Jazz Band with Irma Thomas, along with Zakir Hussain’s show with bassist Dave Holland, will make for jazz and crossover music experiences our audience will never forget,” says Dwight Vaught, executive director of the Schwartz Center. Sunday, Oct. 22, 4 p.m. The talented singers of the Vienna Boys Choir are world-renowned for their celestial voices, rapturous harmonies, and above all, a wide-ranging repertoire spanning centuries. Captivating audiences for more than 500 years, the Vienna Boys Choir has been associated with many of the world’s great composers, including Mozart and Bruckner. Franz Schubert himself was a chorister. A classical tabla virtuoso of the highest order, Zakir Hussain’s consistently brilliant and exciting performances have not only established him as a national treasure in his native India, but gained him worldwide fame and an impressive list of accolades. His latest collaboration is an exploration of the longstanding relationship between jazz and Indian classical music featuring legendary bass player Dave Holland. Crescent City’s “Soul Queen” Irma Thomas joins the lively sound of Preservation Hall’s Legacy Quintet and the spiritual authority of the Blind Boys of Alabama for an unforgettable evening of music showcasing “The Heart and Soul Queen of New Orleans. Saturday, Feb. 3, 2018, 8 p.m. Hailed as “an artist to treasure” by the New York Times, Susan Graham rose to the highest echelon of international performers within just a few years of her professional debut, mastering an astonishing repertoire and range of genres along the way. Interestingly, this distinctly American artist has also been recognized throughout her career as one of the foremost exponents of French vocal music. Creators of an orchestral tradition unique to China, CNSO’s performance will be led by phenom conductor Tan Dun, who is celebrated for his award-winning film scores, has conducted the world’s leading orchestras, and collaborated in performance with such legendary artists as Yo-Yo Ma, Plácido Domingo, Sharon Isbin, Wu Man, Lang Lang, Joan La Barbara, Anssi Karttunen, and the Kronos Quartet. Sunday, April 15, 2018, 7 p.m.
American pianist Murray Perahia has become one of the most sought-after and cherished pianists of our time, performing in all of the major international music centers and with every leading orchestra. With his masterful technique and elegant interpretation, Perahia continues “to breathe freshness and distinction into works we’ve heard many times before, but seldom played at this inspired level.” (Chicago Tribune). Concert subscription packages and tickets for individual shows are on sale now. Individual tickets may be purchased in person, by phone or online through the Arts at Emory Box Office. For details on subscription packages, call the Arts at Emory Box Office at 404-727-5050 or subscribe online.